It’s the beginning of the silly season in Jamaica. In reality, there seems to be #SillySeason year round as our government and opposition consistently do silly things, but the season takes on a special aura especially when elections are called. The PM , who promised she would not call elections until she was ‘touched by God’ finally got the heavenly touch and elected to ‘Step Up the Progress” on February 25, 2016. The opposition disagreed claiming their vision was the right vision as they would take the country from “Poverty to Prosperity”. Both parties laid out two road maps that are as far apart as the East is to the west coast of Jamaica. The divide between the parties are not unusual. 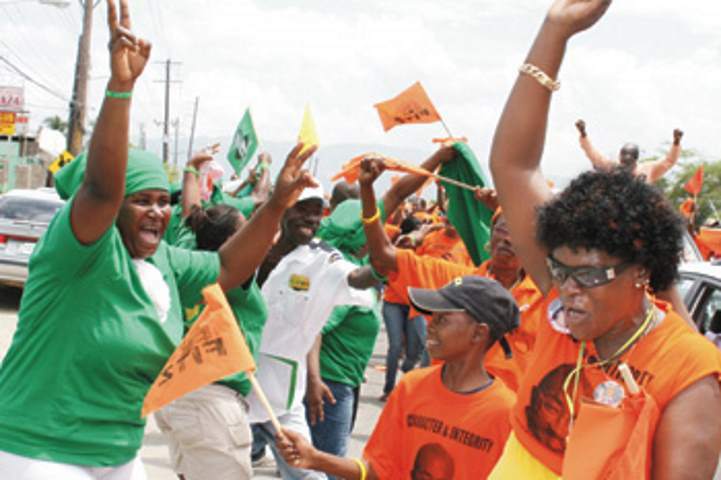 From our independence both parties have coloured themselves with different colours of prosperity- The PNP choosing the color orange , the JLP green. These colours have become so politically engraved in the psyche of ordinary Jamaicans that many have died wearing them. The silly season takes no prisoners. The colors represent battlegrounds and despite calls and breakfasts to pray for unity, during the season these colors never meet. Indeed it is not unusual that people of both parties refuse to even wear clothing of the colours for fear of being called a ‘sell out’ or accused of being a traitor. 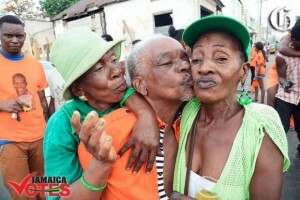 It was therefore not surprising when an image published by the Gleaner with supporters of both parities hugging and even kissing on the cheek made headlines. Was this a sign that Jamaicans can enjoy the season without fear or repercussions and more importantly co-exist peacefully despite their respective leader’s rhetoric? This unusual display of unity proved only to be fantasy as no sooner than 24 hours later the leaders of the parties indicated that nothing has changed and silly season rhetoric took center stage on the political grand stand. At issue is the agreement for both parties to participate in the National Debates. The ruling PNP is refusing to participate because the PM , on one side is threatening lawsuits, demanding apologies to her integrity and answers to personal matters relating to the Opposition leader while on the other Andrew Holness’ refusal to submit ‘the answers’ and calling on his lawyers to protect his legal rights. The lines are once again drawn. The supporters are hugging and kissing , the leaders are fighting with legal daggers drawn. I guess the best things in life are silly. Suppose you were an idiot, and suppose you were a Candidate of a political party; but I just repeated my self . To say I am disappointed is an understatement. Politics have no relation to morals. Our entire political history rebels at the thought of somehow giving politicians the power to control men’s minds. This power was the cause of a torrid history of political violence that made the transition from the politics of violence to peaceful democracy a rather messy one. The name calling by the leaders does nothing to improve the understanding or move the political debate forward and they both know this. Consequently the refusal by the PNP to participate in the National Debates does nothing to advance their political trademark , ‘Step Up to Progress”. Is it that the PNP seems to have found a political ploy: picking up whatever issue the JLP is vulnerable on and champion the cause? Is the real reason for this posturing a deliberate attempt to divert their own short-comings? The PM knows the silly season has no morals and name calling is commonly practiced on both sides as cooking ackee with salt-fish. Both are pandering to their side of the political divide and that only brews up continued political violence from the uneducated mass, and both parties have a surplus. Andrew by his comments clearly seems to be playing the man and not the politics and Portia, by her reticence is putting her feet in tepid waters of paranoia whereby the same uneducated mass will feel justified to turn to violence to remedy imagined threats. In the silly season one thing is clear and that is political civility is not about being polite to each other . It is about reclaiming the power of both JLP, PNP and all the other P’s to come together , debate the common good and call the Jamaican democracy back to its highest values amid our differences. The silly season does not have to be silly and the voters have already tasted that savory fruit as evident in the picture above. In the very end this political stand off is only trumping one thing – Whose policies will serve Jamaica best? No debate means no answers. It would therefore seem the 51% of independents may have a point to their stand off and refusal to participate in this political season of silliness. No part of a politician’s ego is more indispensable than fighting for an informed electorate and ultimately peaceful elections. Remember to share this article on Facebook and other Social Media Platforms. To submit your own articles or to advertise with us please send us an EMAIL at: [email protected].